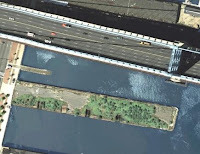 There's an opportunity to learn more about Philadelphia's Race Street Pier (Pier #11 just south of the Ben Franklin Bridge) and the Delaware River Waterfront Corporation's (the new Penn's Landing Corp.) plans to redevelop it as a destination park. A public engagement meeting is scheduled for Tuesday, January 11th from 6:30-8:00pm at the Blue Cross River Rink. Free skating afterwards until 9pm! You can easily walk from the 2nd Street stop of Market- Frankford line or ride your bike.